POW3R Event is a meeting and event planning company with a focus on event technology. 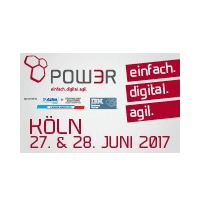 Our ARCAD team will be present at the POW3R event, scheduled the 27th and 28th of June in Cologne, Germany. Meet the ARCAD's team during the COMMON Denmark! Common Sweden is the Swedish local IBM Power Systems user group. Come and meet the ARCAD's team! IBM, ARCAD Software and GitHub invite you to a breakfast briefing. Gain 2 hours of valuable education with demo to better understand the latest techniques in DevOps, agile application deployment, and open source collaborative tooling on IBM i. Join iTour event 2017, a collaboration betwenn COMMON Europe and the local country organisations. Come and meet the sponsors: Vision Solutions and ARCAD Software, industry leaders. Come and meet the ARCAD team for the upcoming WMPCA event! Now is the time for you and your organization to discover the full power of IBM i. Attend NEUGC to learn how to maximize the business value of this robust platform! Get ready for an exciting new experience this May. Extra education. Panel discussions. Mid-morning keynotes. You’ll want to experience the POWER of this conference. Come and meet the ARCAD team at the COMMON US event! Come and meet the ARCAD team for the upcoming i-UG International i-Power, the biggest UK event for users of the IBM i! Come and meet the ARCAD team at the COMMON Europe event! Save the date for Three Days of Inspiration and meet the ARCAD team at the Ocean User Group of Southern California! Come and meet the ARCAD team at the VTMUG event! Advance your skills at the RPG & DB2 Summit and meet the ARCAD team! Book your place for the COMMON Fall and meet the ARCAD team! Register today for the COMMON Denmark and meet the ARCAD team! Gartner Symposium/ITxpo The Conference for Europe's Leading CIOs and Senior IT Executives Embrace game changing technology trends and drive growth and value in your organization. Prepare to be inspired with the ARCAD Team, Silver Sponsor this year, Join us in Barcelona! Book your place for the POW3R event in Schweinfurt and meet the ARCAD team!